The HP 6600 Switch Series are advanced data center server edge switches. 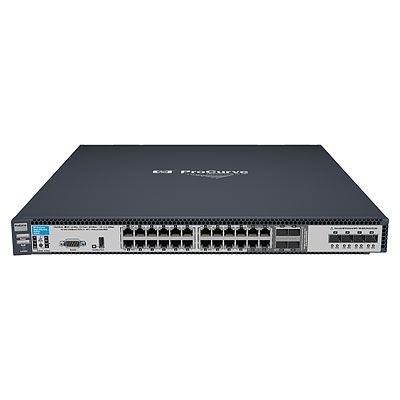 The 6600 Switch Series includes 10/100/1000BASE-T and 10 GbE SFP+ 1U rackmount switches enhanced for server edge connectivity with front-to-back (reversible) airflow, redundant hot-swappable power, and redundant hot-swappable fans. The foundation for the switch series is a purpose-built, programmable ProVision ASIC that allows the most demanding networking features, such as Quality of Service (QoS) and security, to be implemented in a scalable yet granular fashion. With a variety of connectivity interfaces and expanded buffering, the HP 6600 Switch Series offers excellent investment protection, flexibility, and scalability, as well as ease of deployment and reduced operational expense.